1. Read the article, “Association Between Sarcopenia and Nutritional Status in Older Adults: A Systematic Literature Review” found on pages 33–41, carefully noting any tables and other illustrative materials that are included to enhance your knowledge and understanding of the content. Be sure to keep track of the amount of time (number of minutes) you spend reading the article and completing the quiz. 2. Read and answer each question on the quiz. After completing all of the questions, compare your answers to those provided within this issue. If you have incorrect answers, return to the article for further study. 3. Go to the Villanova website listed above to register for contact hour credit. You will be asked to provide your name; contact information; and a VISA, MasterCard, or Discover card number for payment of the $20.00 fee. Once you complete the online evaluation, a certificate will be automatically generated. This activity is valid for continuing education credit until June 30, 2019. This activity is co-provided by Villanova University College of Nursing and SLACK Incorporated. Villanova University College of Nursing is accredited as a provider of continuing nursing education by the American Nurses Credentialing Center's Commission on Accreditation. 1. Describe the geriatric syndrome of sarcopenia. 2. Identify the outcome of the sarcopenia studies. Neither the planners nor the authors have any conflicts of interest to disclose. Changes in body composition are associated with advanced age. Longitudinal studies show that body fat mass begins to increase and lean muscle mass and thigh muscle area begin to decrease at approximately age 35 (Frontera et al., 2000). The efficiency of muscle mass (i.e., muscle quality) also decreases with age. The dimensions depend on the individual activity level and other environmental factors (Cruz-Jentoft et al., 2010). The term sarcopenia, defined as age-related loss of muscle mass, was first used in the 1980s by Irvin Rosenberg (1997). Since then, numerous definitions of sarcopenia have been published. Prevalence rates vary depending on the accepted definition and range from 15% in individuals younger than 70 to more than 50% in individuals 80 and older (Baumgartner et al., 1998). Therefore, sarcopenia is an important geriatric syndrome with substantial adverse outcomes for patients and the health care system. Sarcopenia is one of the most common causes of reductions in mobility and quality of life and increasing dependency in older adults, leading to increased health care costs (Cruz-Jentoft et al., 2010). However, it is not only loss of muscle mass that affects the quality of life in older adults, but also their nutritional status. Epidemiological cohort studies indicate that, in the Western world, the average body weight increases continuously up to age 65. From 65 years of age on, considerable increases or losses of body weight may occur in older adults, whereas in the very old, weight loss is unintentional and seems to have a greater impact on outcomes such as care dependency, quality of life, and mortality (de Groot et al., 2002; Newman et al., 2005). Recent studies suggest that an association potentially exists between sarcopenia and malnutrition, which is understood as undernutrition, overnutrition, or a lack of special nutrients (Elia, 2005). On the other hand, some studies demonstrate that even older adults with a normal nutritional status can experience sarcopenia (i.e., the condition is not always associated with a suboptimal nutritional status) (Hedayati & Dittmar, 2010). Few studies, however, address the co-occurrence of sarcopenia and malnutrition in detail (Vandewoude, Alish, Sauer, & Hegazi, 2012). Therefore, the goal of the current systematic literature review is to highlight the correlations of sarcopenia with the nutritional status of adults 60 and older. In July 2014, a comprehensive literature search was conducted by two individuals independent of one another (D.E., S.E.). For this purpose, the following scientific databases were searched: MEDLINE (PubMed); CINAHL; and EMBASE, PASCAL, and the Cochrane Library (all via Ovid). In addition, resources available via Google Scholar as well as the meta search engines Metacrawler™ and Dogpile® were searched. Furthermore, a manual search in the reference lists of articles identified as relevant was performed to identify additional pertinent studies. The literature search was conducted using the following English keywords: “muscular atrophy,” “sarcopenia,” “muscle strength,” “skeletal muscle mass,” “elderly,” “aged,” “aged 80 and over,” “older people,” “nutrition,” “nutritional status,” “nutritional state,” “malnutrition,” “malnourished,” “undernutrition,” “overnutrition,” “obesity,” “sarcopenic obesity,” and “overweight.” When available, the relevant MeSH terms or medical headings were used, and the necessary truncations were applied. Combinations of keywords using the Boolean operators “AND” and “OR” were also used. The systematic search was limited to studies published during the past 5 years (2009–2014) to keep the literature review as current as possible. The keywords defined needed to appear in the title or abstract. After the two reviewers had screened the titles and abstracts, the full texts of the articles were reviewed if the following criteria had been met: (a) the studies had a cross-sectional design; (b) all study participants were 60 or older; and (c) the relationship between nutritional status and sarcopenia represented at least a secondary objective variable. Studies that met these inclusion criteria were subsequently reviewed on the basis of their methodological quality using the Strengthening the Reporting of Observational Studies in Epidemiology (STROBE) checklist (von Elm et al., 2014). If reviewers did not agree about the eligibility of an article, a consensus was reached following a discussion between the two reviewers. Of a total of 1,728 identified publications, 498 duplicates were removed. After title and abstract screening was conducted, 64 articles were selected for subsequent full review. An additional pool of 28 studies was excluded because they did not meet inclusion criteria. Forty-two articles were reviewed with regard to their methodological quality. 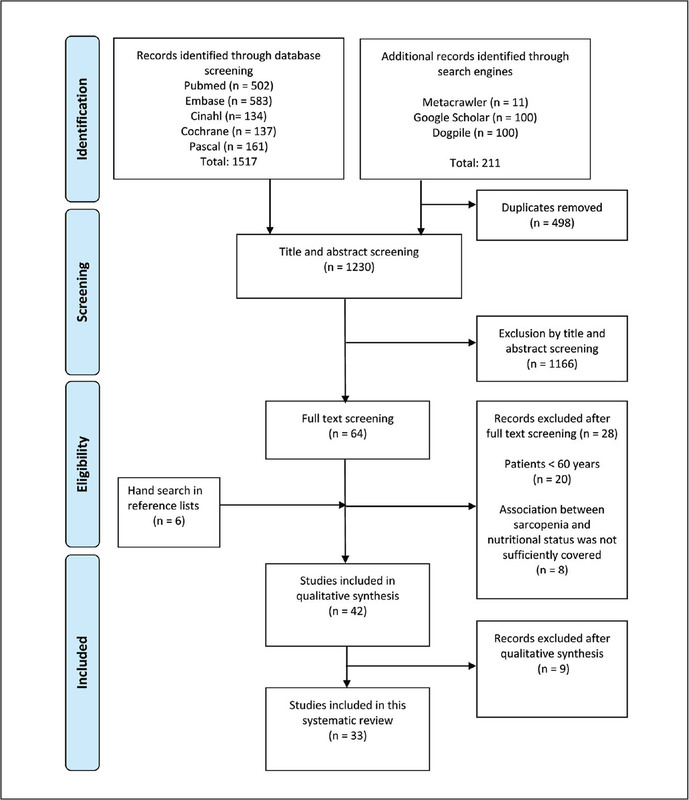 A total of 33 observational studies were ultimately included in this systematic review (Figure). Flow diagram showing selection of included articles on the basis of the PRISMA scheme (Moher, Liberati, Tetzlaff, & Altman, 2010). Articles published between 2009 and 2014 were included in the current systematic review. The number of articles published increased with each year, with the highest number seen in 2014 (n = 12). This increase in articles indicates that interest in sarcopenia is growing among members of the scientific community. Studies were performed all over the world, with study sites reported in the United States, Korea, Brazil, and many European countries, such as Italy, Turkey, Germany, and France. The examined literature showed that the majority of studies on sarcopenia and nutritional status were conducted on community-dwelling older adults (n = 28). Only a few publications focused on older adults living in nursing homes or who had been admitted to hospitals. The sample sizes reported in the articles considered varied from 48 to 4,000 participants, with only two studies including <100 participants. In the 33 studies that formed the basis for the current literature review, numerous methods were used for the detection of sarcopenia (Table 1). Many authors used a single parameter to determine sarcopenia, most often measurements of muscle mass. Some authors defined sarcopenia using a combination of parameters (e.g., measured reductions in muscle mass, decreased muscle strength). Seven studies defined sarcopenia based on the recommendation of the European Working Group on Sarcopenia in Older People (EWGSOP; Cruz-Jentoft et al., 2010). To determine the nutritional status of participants, the authors again used a variety of methods. The nutritional status of older adults was mainly defined with reference to body mass index (BMI). Some authors used a malnutrition screening tool, most often the Mini Nutritional Assessment (MNA) both in the short (MNA-SF) and long (MNA-LF) form. One study determined the nutritional status of participants using the screening tool Seniors in the Community: Risk Evaluation for Eating and Nutrition (SCREEN II). 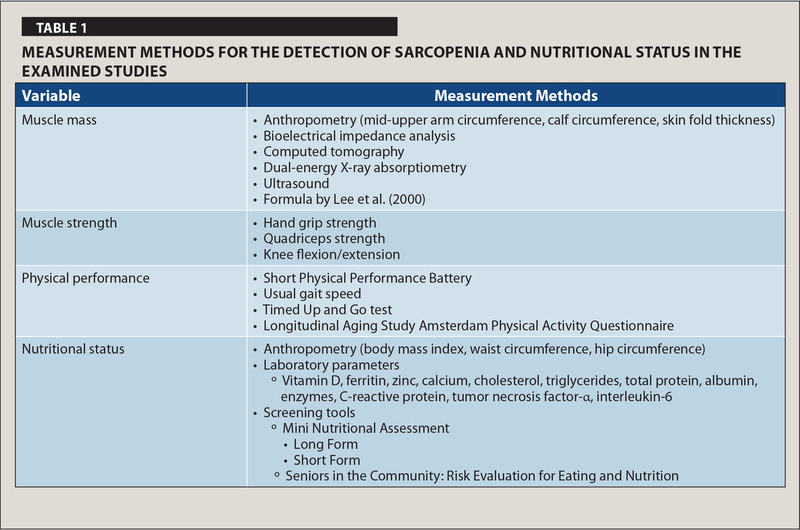 A list of all instruments used for the determination of nutritional status and sarcopenia is shown in Table 1. Eighteen of the 33 studies examined the relationship between sarcopenia and anthropometric parameters. Most authors used BMI or body circumference measurements, such as waist circumference, to evaluate nutritional status. The results can be divided into two groups: (a) high anthropometric parameters were associated with a decreased risk for sarcopenia (i.e., negative correlation); and (b) high anthropometric parameters were associated with an increased risk for sarcopenia (i.e., positive correlation). Twelve studies reported that a negative correlation existed between sarcopenia and anthropometric parameters (i.e., the higher the anthropometric parameters, the lower the risk of sarcopenia). A higher BMI, therefore, was associated with higher muscle mass, greater muscle strength, and/or improved physical performance (Abe, Loenneke, & Fukunaga, 2014; Delmonico et al., 2009; Dupuy et al., 2013; Figueiredo et al., 2014; Gariballa, & Alessa, 2013; Landi et al., 2012; Queiroz et al., 2014; Rondanelli et al., 2014; Smoliner, Sieber, & Wirth, 2014; Volpato et al., 2014; Wu et al., 2014; Yu et al., 2014). Only seven studies assessed sarcopenia using the EWGSOP definition of sarcopenia and, therefore, showed comparable results. All studies demonstrated a negative correlation between sarcopenia and anthropometric parameters; participants with sarcopenia were demonstrated to have a significantly lower BMI and poorer nutritional status than participants without sarcopenia. A low BMI served as an independent predictor of all levels of severity of sarcopenia (Alexandre Tda, Duarte, Santos, Wong, & Lebrão, 2014; Annweiler et al., 2010; Landi et al., 2013; Smoliner et al., 2014; Volpato et al., 2014; Wu et al., 2014; Yu et al., 2014). However, six studies reported contrary results, reporting positive relationships between sarcopenia and anthropometric parameters (i.e., the higher the anthropometric parameters, the higher the risk of sarcopenia). The results of these studies indicated that a higher BMI was associated with proportionally lower muscle mass, less muscle strength, and/or poorer physical performance (Annweiler et al., 2010; Brady, Straight, Schmidt, & Evans, 2014; Chung, Kang, Lee, Lee, & Lee, 2013; Dretakis et al., 2010; Halil et al., 2014; Seo et al., 2013). These results thereby confirmed the existence of the problem of sarcopenic obesity. In 13 of the 33 examined studies, the relationships between sarcopenia and nutrition-relevant laboratory parameters were examined in detail. Five of 10 of these studies, of which five had a large sample, on vitamin D showed correlations between vitamin D deficiency and sarcopenia (Chung et al., 2013; Figueiredo et al., 2014; Houston et al., 2012; Seo et al., 2012; Tieland, Brouwer-Brolsma, Nienaber-Rousseau, van Loon, & De Groot, 2013). Chung et al. (2013) reported both a positive correlation between vitamin D levels and muscle mass and a positive association between cholesterol, triglycerides, and muscle mass. In the cohort study “Health ABC Study” (Houston et al., 2012), participants' vitamin D levels were significantly correlated with physical performance (i.e., transition speed, Short Physical Performance Battery) and muscle strength (i.e., leg press ability, hand grip strength). In the follow-up study, conducted after 4 years, physical performance and muscle strength had decreased significantly, but these changes could not be associated with vitamin D levels at baseline (Houston et al., 2012). Patients with low vitamin D levels at baseline, therefore, had no greater decrease in muscle strength than patients with normal vitamin D levels (Houston et al., 2012). The remaining publications that reported vitamin D levels in serum and sarcopenia did not show significant correlations (Annweiler et al., 2010; Dretakis et al., 2010; Figueiredo et al., 2014; Volpato et al., 2014). A clear relationship between serum albumin and sarcopenia has not been demonstrated in the examined studies. Although Rondanelli et al. (2014) reported that serum albumin was not affected by sarcopenia, an Italian study found significantly lower albumin values in patients with sarcopenia (Gariballa & Alessa, 2013). However, in this study muscle mass was defined solely by measuring the upper arm circumference (Gariballa & Alessa, 2013). Another study cited a nearly significant relationship between albumin and sarcopenia (Volpato et al., 2014). One study described an association between ferritin levels in the serum and sarcopenia. The authors showed that patients with sarcopenia had significantly higher serum ferritin values. Whether the high ferritin level in the serum was primarily due to sarcopenia or represented a secondary effect could not be determined in this cross-sectional study (Kim, Hwang, & Kim, 2014). Eight studies that used screening tools to evaluate the nutritional status of participants (i.e., MNA-SF, MNA-LF, SCREEN II) were included in the current overview. Six of these studies specifically reported relationships between the screening scores and existing sarcopenic conditions in the presentation of their results (Table 2). All studies showed that individuals with sarcopenia had a poorer nutritional status and increased risk of malnutrition, as measured by the screening tools, than individuals who did not have sarcopenia (Asp, Richardson, Collene, Droll, & Belury, 2012; Kaburagi et al., 2011; Smoliner et al., 2014; Wham, Teh, Robinson, & Kerse, 2011; Wu et al., 2014; Yaxley, Miller, Fraser, Cobiac, & Crotty, 2012). Two studies showed that individuals with sarcopenia had significantly lower protein intakes than patients without sarcopenia (Asp et al., 2012; Geirsdottir, Arnarson, Ramel, Jonsson, & Thorsdottir, 2013). However, this relationship was not detected in four other studies, including two cohort studies with large numbers of participants (N = 4,000 and N = 2,221, respectively) (Hwang et al., 2012; Seo et al., 2013; Volpato et al., 2014; Yu et al., 2014). With regard to the total caloric intake and its association with sarcopenia, two studies examined the relationship and yielded conflicting results (Seo et al., 2013; Volpato et al., 2014). The Korean KNHANES study investigated the correlation between calcium intake and the presence of sarcopenia. Participants with sarcopenia had significantly lower daily calcium intakes as compared with participants without sarcopenia (p < 0.001). The higher the daily calcium intake, the higher the percentage of muscle mass (Seo et al., 2013). Three studies examined associations between anorexia (defined as reduced nutritional intake) and sarcopenia, yielding significant results. These findings supported the assumption that anorexia as a result of aging and subsequent malnutrition can be directly correlated with the existence of sarcopenia (Landi et al., 2013; Mohamad, Suzana, Noor Ibrahim, & Norshafarina, 2010; Yaxley et al., 2012). To the current authors' knowledge, this is the first systematic literature review that specifically examines the relationships between sarcopenia and the nutritional status of older adults. The current systematic review examines results reported in 33 studies that investigated correlations between sarcopenia (mostly diagnosed by low muscle mass, low muscle strength, or poor physical performance) and nutritional status, at least as a secondary parameter. Most of the analyzed correlational studies were performed in community-dwelling older adults, whereas only a few were performed in hospital settings or long-term care facilities. The number of studies indicates that attention has been focused primarily on older adults living at home. Among patients in hospitalized and long-term care settings, sarcopenia appears not to have yet received the necessary attention. When considering the recently published literature, it can be assumed that sarcopenic obesity is not uncommon in western countries. Trials that included healthy older adults, especially those living at home, showed that sarcopenic obesity exists (Brady et al., 2014; Chung et al., 2013; Dretakis et al., 2010; Halil et al., 2014; Seo et al., 2012; Seo et al., 2013). However, the main problem seems to be that individuals with sarcopenia, and most particularly older adults with multiple morbidities, have a poor nutritional status as defined by their low body weights and other anthropometric parameters (Abe et al., 2014; Delmonico et al., 2009; Dupuy et al., 2013; Figueiredo et al., 2014; Gariballa & Alessa, 2013; Landi et al., 2012; Queiroz et al., 2014, Rondanelli et al., 2014; Smoliner et al., 2014; Volpato et al., 2014; Wu et al., 2014; Yu et al., 2014). Maintaining a healthy body weight, muscle mass, muscle strength, and physical performance as one ages seem to be the best protection against developing sarcopenia (Brady et al., 2014). 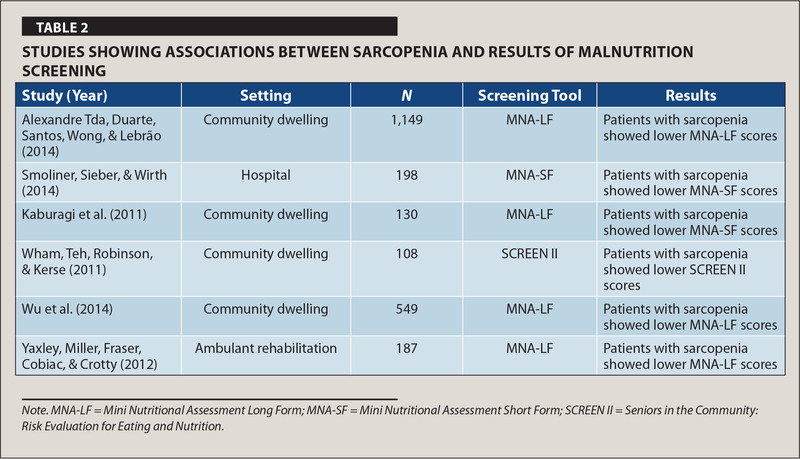 All examined studies that analyzed nutritional status using malnutrition screening tools showed that patients with sarcopenia were more frequently diagnosed as malnourished than patients without sarcopenia. Nutrition screening tools do not only use a single parameter to assess nutritional status (e.g., BMI, laboratory values). Instead, they assess several factors and ask questions about weight loss that has occurred during recent months or the current nutritional intake and medical diagnoses of patients. These results indicated that using a nutritional screening tool that combines different parameters for the determination of nutritional status may be beneficial. Although associations between sarcopenia and serum albumin were not clearly demonstrated in the studies examined, a convincing correlation between sarcopenia and vitamin D seems to exist. Cross-sectional studies with large samples reported that older adults with sarcopenia showed lower vitamin D levels than older adults without sarcopenia (Chung et al., 2013; Houston et al., 2012; Kim et al., 2014; Seo et al., 2013). This finding suggests a strong positive correlation between sarcopenia and serum vitamin D levels. Correlations between low protein intake with existing sarcopenic conditions could only be shown in two of six trials (Yaxley et al., 2012; Yu et al., 2014). The problem with these studies was the method of recording food intake. Nutritional intake is often documented using diet questionnaires. It has been recognized that study participants, especially older adults, often overestimate or underestimate their food intake when using this survey method (McNeill, Winter, & Jia, 2009). It is, therefore, not surprising that few significant correlations could be demonstrated in the studies examined. A major problem encountered while interpreting and comparing the results of these studies was the absence of a generally accepted definition for sarcopenia (Cruz-Jentoft et al., 2010). In some trials, sarcopenia was defined as decreased muscle mass; in others, as decreased muscle strength or diminished physical performance; and in still others, as a combination of several parameters. As experts agree that low muscle mass alone cannot explain the clinical syndrome of sarcopenia sufficiently, working groups have developed consensus definitions (e.g., the definition found in the EWGSOP) (Cruz-Jentoft et al., 2010). However, only seven of the 33 studies assessed considered this definition and, therefore, report results that are directly comparable (Alexandre Tda et al., 2014; Annweiler et al., 2010; Landi et al., 2013; Smoliner et al., 2014; Volpato et al., 2014; Wu et al., 2014; Yu et al., 2014). The current literature review has significant implications for future research conducted in the field of sarcopenia. It is vital to apply consistent definitions as well as use diagnostic criteria (e.g., EWGSOP) to generate comparable results. Data for hospitalized older adults and individuals living in long-term care are rarely available, and further studies are needed to gain insight into the associations between sarcopenia and nutritional status in this patient cohort. Because older adults represent a highly inhomogeneous group, the group should be divided into smaller sub-groups by age, and these groups should either be analyzed separately or the study sample should be more narrowly defined. Intervention trials that have been designed carefully to focus on nutritional status with regard to sarcopenia would generate data sufficient for the development of evidence-based interventions in nursing practice. The results of the current literature review show that sarcopenia is closely associated with the presence of malnutrition. The consequences of sarcopenia directly influence the daily lives of nurses, in that patients have greater mobility limitations or increased risks of falls and fractures. Furthermore, limitations in patients' daily activities (e.g., bathing, dressing, preparing meals) influence the nurses' work in all health care settings. For this reason, it is of particular importance that nurses empower older patients and help them maintain a healthy nutritional status and certain level of mobility. Because nurses are in direct contact with patients in all health care settings, they are usually the first individuals to notice nutritional deficiencies or signs of sarcopenia. One of the most important tasks of nurses, therefore, is to identify patients who are at risk using standardized assessments and their clinical judgement. Furthermore, nurses must initiate multidisciplinary cooperation, which means that patients at risk should be offered consultation and referred early on to dietitians or physiotherapists. The training, instruction, and education of nurses with regard to sarcopenia and its connection with nutritional status in older adults, therefore, is of particular relevance. Interventions in everyday nursing practice can only be successful when caregivers are made aware of the impact and potential consequences of a patient's inadequate nutritional status on nursing practice and, moreover, its implications for the development and treatment of sarcopenia. Additional resources for further information on sarcopenia are listed in Table 3. Sarcopenia is a highly prevalent condition among older adults. Despite methodological differences within the studies examined in the current systematic literature review, it was shown that sarcopenia is mainly associated with malnutrition. Therefore, clinicians and caregivers should always consider sarcopenia as potentially present in patients with low BMIs and anthropometric parameters and who have demonstrated recent weight loss or display abnormal pathological nutritional laboratory parameters. In future studies when considering sarcopenia, it will be necessary to use internationally recognized diagnostic criteria to ensure that the results can be directly compared and that evidence-based statements can be derived. de Groot, C.P., Enzi, G., Matthys, C., Moreiras, O., Roszkowski, W. & Schroll, M. (2002). Ten-year changes in anthropometric characteristics of elderly Europeans. Journal of Nutrition, Health & Aging, 6, 4–8. Elia, M. (2005). Principles of clinical nutrition: Contrasting the practice of nutrition in health and disease. In Gibney, M.J., Elia, M., Ljungqvist, O. & Dowsett, J. (Eds. ), Clinical nutrition (pp. 1–14). Oxford, UK: Blackwell Sciences Ltd.
Frontera, W.R., Hughes, V.A., Fielding, R.A., Fiatarone, M.A., Evans, W.J. & Roubenoff, R. (2000). Aging of skeletal muscle: A 12-yr longitudinal study. Journal of Applied Physiology, 88, 1321–1326. Lee, R.C., Wang, Z., Heo, M., Ross, R., Janssen, I. & Heymsfield, S.B. (2000). Total-body skeletal muscle mass: Development and cross-validation of anthropometric prediction models. American Journal of Clinical Nutrition, 72, 796–803. Mohamad, H.A. Jr.. , Suzana, S., Noor Ibrahim, M.S. & Norshafarina, S. (2010). Relationship between appetite, food intake and body composition among elderly Malays from an urban residential area in Kuala Lumpur, Malaysia. Malaysian Journal of Nutrition, 16, 339–348. Newman, A.B., Lee, J.S., Visser, M., Goodpaster, B.H., Kritchevsky, S.B., Tylavsky, F.A. & Harris, T.B. (2005). Weight change and the conservation of lean mass in old age: The Health, Aging and Body Composition Study. American Journal of Clinical Nutrition, 82, 872–878. Queiroz, B.M., da Silva Coqueiro, R., Schettino, L., Pereira, R., Henrique, M. & Barbosa, A.R. (2014). Nutritional status and handgrip strength in community-dwelling elderly with low human development index. Medicina (Brazil), 47, 36–42. Rosenberg, I.H. (1997). Sarcopenia: Origins and clinical relevance. Journal of Nutrition, 127(5 Suppl. ), 990S–991S. Yaxley, A., Miller, M.D., Fraser, R.J., Cobiac, L. & Crotty, M. (2012). The complexity of treating wasting in ambulatory rehabilitation: Is it starvation, sarcopenia, cachexia or a combination of these conditions?Asia Pacific Journal of Clinical Nutrition, 21, 386–393. Ms. Eglseer is PhD Candidate and Research Assistant, Dr. Lohrmann is Head, Department of Nursing Science, and Ms. Eminovic is PhD Candidate and Study Nurse, Department of Orthopedics and Orthopedic Surgery, Medical University of Graz, Graz, Austria. Address correspondence to Doris Eglseer, MSc, RD, PhD Candidate and Research Assistant, Department of Nursing Science, Medical University of Graz, Billrothgasse 6, 8010 Graz, Austria; e-mail: doris.eglseer@medunigraz.at.